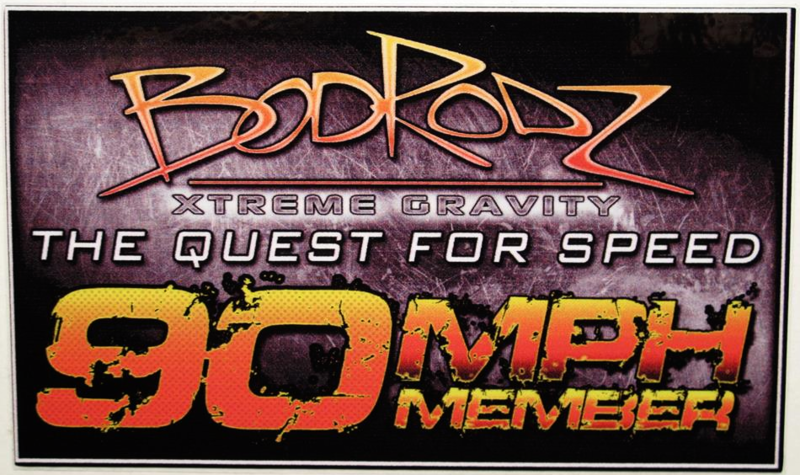 Andy Ash, one of Europe's top gravity car pilots, would meet Doug Anderson, the founder of Bodrodz Xtreme Gravity Racing, at the 2015 East Coast Challenge gravity car road race. Andy had shipped his car over from the UK just to compete in the event's Supercar class in Pennsylvania. Andy, a gravity car designer/builder himself, hit it off with Anderson and had plenty to talk about. Fast Donnie Schoettler, of S.U.C.K.E.R. fame, would also attend the event and win it. The three amigos would become great friends and had little idea what was about to happen in their future. Ash was no stranger to gravity road racing, he began his gravity car racing career in 2001. Andy started competing in the Red Bull UK races, then stepped up to the more serious gravity road racing arena, winning his first race, Belchford Lincolnshire. Ash from there would go on to win numerous races such as Castle Forbes, Border Bogies, Windmill Hill, the list goes on and on. If not winning, he always was making a podium appearance. Ash would runner-up at the historic Cairngorm Extreme Championship. Andy had been even spotted driving the Lola gravity car at the 2013 Goodwill Festival of Speed! Andy Ash had become one of Europe's top gravity car pilots. The three would meet up again in 2016 at the L'Ultime Descente Speed Challenge held in Quebec, Canada. This race would prove to be the fastest gravity race in world history. Now, Fast Donnie Schoettler was now driving under the Bodrodz banner, Andy Ash had offered earlier to help Bodrodz at the race and Anderson was ecstatic to have the European gravity great on the team. Ash would also bring UK gravity sidecar great, Jono Searby along. The two had officially joined the crew and BXGR had just become an international team. Both he and Jono Searby would be key players with Bodrodz success that historic weekend. Jono Searby and Andy Ash pushing Fastdonnie Schoettler into the Guinness world record books in 2016. In 2017, the team was preparing for the 2017 L'Ultime Descente Speed Challenge when Scott Holsenback was injured and would not be able to drive the Scalpel. Anderson would now wheel the Atomic Scalpel, leaving the Sliver driverless. Anderson and the rest of the team knew it was obvious choice who they wanted. Andy jumped at the opportunity. He would be climbing into the cockpit of an unseen gravity car that had never rolled down a hill. Ash would pilot the Bodrodz Atomic Sliver to a WGSA 200 Limited OW world record clocking in with a speed of 147.94 km/h 91.92 mph, adding to his gravity racing accomplishments and proving he was one of the top gravity car pilots in the world!
" With the vacany in the Atomic Sliver cockpit, the team discussed who would be best to take the wheel. It was unanimous, Andy Ash. If anyone could get the Sliver down the hill in one piece, Andy would be the man for the job. There was no doubt Andy had the talent and the experience to make it happen. Andy would have his hands full with the untested new car on the big Canadian hill. It was scheduled for a full aero body but the Scalpel had ate up to much time so Jason and I laid up a quick nose and tail section. We gave Andy a solid machine however it lacked tons in the aero department. We were impressed to say the least, Andy had wheeled the car faster than we thought it would ever go. Not only would Andy set a new WGSA world record, he would return home as Europe's fastest gravity car pilot ever! From all your BXGR teammates, thanks Andy "
The UK Members of the Bodrodz Team flew out to Montreal on the 13th Sept 2017. After an overnight layover in Drummondville they drove to the House in Baie St Paul that was to become Bodrodz HQ for the next 5 Days. After we had met the new members of the team. We had to Divvy out the rooms, Doug, Jason, Chris and John had already sorted out their rooms. At this point Jono decided to take one for the team and have the box room in the attic. Donnie was still to show at this point. Once we had all got settled , we turned our attention to the race cars. Doug`s car , ` The Scalpel` just needed a headrest fitting and a general nut and bolt check after the roadtrip to Quebec. The ` Sliver ` was a totally brand new machine for me. We needed first of all to do a nut and bolt check, then come up with a seat/headrest solution. Jono and Graham were straight on it with the foam and gaffa tape and soon made a safe, strong and supportive structure. Once the seat position was finalized, attention was focused on the chute release mechanism. This was a foot operated lever, mounted on the right hand side of the chassis. Doug and Jason oversaw this as we had never used a chute on any of our cars. We then had a Chute packing tutorial from the Pros , and we were good to go !! At around 7.30pm there was still no sign of Donnie, so we all headed into Baie St Paul for the Drivers sign up meeting. Even though the Bar we were meeting at had undergone an external facelift and had absolutely no signage , we drove straight to it !!! Once inside it was great to meet up with Old friends we had met from last year. It was fantastic to see Paul and Iain who had made the trip from Scotland. We filled out our entry forms and for the first time, it all felt very real for me. I had been involved with Team Bodrodz last year as part of the crew, but this time round I would be in the Drivers seat. We left the Bar around 10pm and headed back to Basecamp. We were all delighted to find Donnie waiting in his car. The Team was now complete !!! We had a big catch up and then settled down for the night. Massive day ahead for us all tomorrow !! We were due to roll off on the Hill at 8.40 am, so alarm clocks were set for early. We left base around 7.00 am and headed to McDonalds for breakfast.We ordered our food using our finest Anglo French. Needless to say, none of us got what we had ordered !!! This was to become a recurring theme. Once on the hill we got the cars unloaded and did our final checks. We had time to spare so we did a quick reccy of the Hill......Yes, it was still there and it was still very steep !! As 8.40am approached, the cars were wheeled down to the start line. The five minute warning went up and the Boys strapped me into my car. The G Bikes rolled off first, then it was time for the cars. Jono pulled my Safety and showed me the tag. I was rolled onto the line. A nervous 30 second wait then I was given the all clear by the starter. This was the first time I had driven the car. As far as I was aware this was the first time anyone had driven this car !! Rolling up to about 30mph I did a steering test. Lock to lock a few times, see how it felt...and it felt good. Self centered sweetly too. Then the brake test...Rears first,no dramas...Then the Fronts. Again no dramas. However they were not exactly pulling the fillings from my teeth !! I elected to make this run very much a sighter and was regularly on the brakes during the descent. Steady away through the speedtrap . Easy does it round the big right hander. Then thought better let this chute go....Big push on the lever...Nothing......Then a couple of seconds later, it kicked in. Yet again no dramas. I had two more runs, a 77mph and then 83 mph so I was heading in the right direction as my confidence grew. We were not due to roll off until 11.40 am so we got a bit of lay in. We took the opportunity in the morning to do some more work on Donnie`s car. Then headed off to the Hill, Via Macdonalds, where we got another bag full of surprises for breakfast... The cars were unloaded and checked over. We moved to the line and got readied for our first run of the Day. I was now feeling a bit more at ease with the car and the Hill. I was called up to the line and given the all clear from Jono. Rolling off I stuck to My line. A metre to the right of the central yellow lines. The speed building I rounded the right hander. As the crest of the hill approached I had a quick dab on the brakes. Then it was over the edge. Keeping an eye on the yellows. As I got to the central reservation , before the speed trap , I had to steer a little to the right. This unsettled the car and I felt it slide. I had to correct it to the left before the finish line. Put the brakes on hard to scrub the speed, then drive it round the big right. The car was sliding a little but it all felt under control. Pull the chute and coast into the recovery area. Before my second run I had been chatting to some guys who knew the hill. It turns out that "My Line" was probably not the best way to get down the Hill in one piece. By hugging the yellows, I was creating a high speed chicane as I passed the central reservation. Lesson learnt. So, second run...I had now got full confidence in the car. It handled predictably, stopped in a straight line and didnt want to kill me. I now knew The Line on the Hill. All I had to do was fully open the taps and see what speed I could achieve...From the roll off I knew what to do. Keep it smooth to the Cliff...Then aim for the gap at the bottom of the Hill. What started out as a tiny gap was getting bigger. Before I knew it , I was past the central reservation, through the traps and entering the slow down zone....What a Rush !!!!! First time from top to finish line.. with no brakes... We got a speed from Ronald Cossan. 90.16 mph.....The Boys were buzzing. I could not now wait for the next run. It had taken me 5 runs to be able to take the Hill flat....and wow , that was exciting !! I lined up for run 6 pretty calm...then just rolled off and aimed for the gap ....Boom !! 91.88 Mph....... That was all in for me. I couldnt have driven a smoother line. All in all.......A Fantastic Day on the Hill for Team Bodrodz !!! The mystery bag from McDonalds was not bad today ! So spirits were high. On the Hill there was very much a last Day feeling. A lot of people felt that they had maxed out yesterday, and there was a more relaxing feel to the Day. Lots of group runs and photo opportunities. Everyone was slightly slower than yesterday. On My last run of the day I had decided before the off, that I was probably not gonna improve on Saturdays Speed, so it was a gentle descent. I'd had a fantastic weekend on the Hill and now was not the time to push my luck. An 82.1 Mph (132.19 Kph) run was the result, but most of all, The car was still in one piece and so was I.
John Nichols, Jono Searby,Graham Thompson,Jason Camp,Donnie Schoettler , Doug Anderson, Chris Schafer. I have been involved in Team sports from a young age and was taught, there is no " I " in Team. I can not thank these Guys enough for helping me over the weekend. Keeping me safe and for being 100% Professional. A special mention also to Paul Janson And Iain Rooney, My good friends from Scotland , who put everything into this event. Both of them braking the 70 Mph Barrier on the G Bike and in their G Car. Also massive thank you goes out to Charles , Jonathan and their brillant team for hosting this totally unique event. Who knows what will happen in the future for High Speed Events? But one thing is for sure, Team Bodrodz will be at the sharp end. Ash and Bodrodz UK teammates getting class on folding the Sliver laundry.